A season like no other Mets season, with its formidable start followed an epic slide, took a sudden sad turn on Tuesday, June 26 when General Manager Sandy Alderson announced he was taking a medical leave of absence to undergo treatment for a recurrence of cancer. In his absence, the Mets announced that his duties would be split among Assistant General Manager John Ricco and special assistant’s Omar Minaya and J.P. Ricciardi, both former general managers. With the Mets coming into the season with a new manager and high expectations, Alderson had come under increasing pressure in recent weeks as the team’s hot start deteriorated into a 5-18 June and an overall 32-45 record that was barely above last place. Facing criticism for the under-performing veteran team he constructed along with few highly-rated prospects in the minor league system, the 70-year-old Alderson, who was originally treated for cancer during the 2015 offseason, said he was informed of the cancer’s return in late April and had been undergoing chemotherapy treatments since then. At Tuesday’s press conference, Alderson took responsibility for the team’s disappointing play, but also expressed confidence in Ricco, Minaya and Ricciardi. “I’m sure, [they] will take a hard look at where we are, maybe take a fresh look at where we are. And I have every confidence that they will serve the franchise well over the next few months through the end of the season,” he said. Alderson was a highly regarded baseball executive baseball executive when the Mets hired him in October 2010, with a resume that included a World Championship as general manager of the Oakland A’s in 1989 and helping to pioneer the use of sabermetrics in player evaluations to go along with a law degree and a tour of duty in the Viet Nam War as a member of the U.S. Marine Corps. Like any general manager, Alderson had his hits and misses. Trades such as dealing 2012 Cy Young Award winner R.A. Dickey to Toronto yielded Noah Syndergaard and Travis d’Arnaud while his 2015 trade deadline acquisition of Yoenis Cespedes provided key pieces to the 2015 pennant winning club. On the flip side, signing Cespedes and David Wright to multi-year deals hasn’t worked out as planned although both deals were generally applauded at the time they were made. While the disappointing 2017 and 2018 seasons may tarnish Alderson’s record as Mets GM somewhat, the Mets won the 2015 NL pennant under his regime, and for a team that only has five pennants since 1962, that isn’t a minor accomplishment. 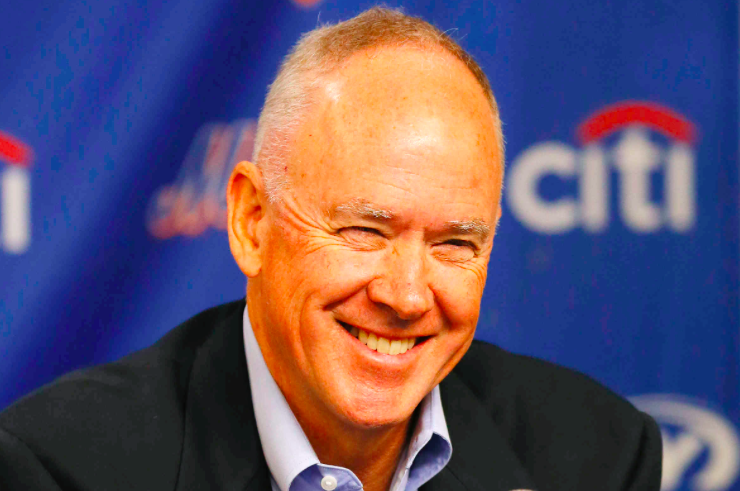 Thank you, Sandy Alderson, and we wish you swift and complete recovery.